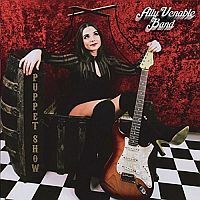 Unlike a lot of today’s blues rock outfits, the songs on “Puppet Show” are tight and vibrant enough while bristling with that vital amount of potency to warrant repeated listens. Basically, if you dig guitars that rattle along with strident grit and a voice whose soulful croak sounds hard earned and genuine, then this is exactly what you’re looking for. “Cast Their Stones”, stuffed with syncopated beats and sprinkled with woozy funk rolls around in glorious fashion, while “Devils Son”, the album’s engaging opener, sounds so filthy it might well have just been dredged from a newly dug grave. There’s plenty more to like. “Comfort in My Sorrow” melts delicate vocals and steaming guitar play into a fondue of slow burning passion. “Waste it on You” is a cool slab of knife-edge, swampy funk, and there’s a satisfying primal crackle to “Bridges to Burn”. Obviously, Venable can slow things down nicely, as she tries out more sophisticated balladry with the gorgeous title number - and again it pays dividends.